1:20 AM high 4.0 ft.
8:00 AM low 0.7 ft.
1:47 PM high 3.2 ft.
8:12 PM low 0.9 ft.
7 more station photos available, click to view. How to reach: To reach the tidal bench marks from the intersection of 17 south and 74 East in Wilmington, proceed east on 74 east for 8.0 km (5.0 mi) toward Wrightsville Beach, once over the drawbridge bear left on 74E to the intersection of Lumina Avenue and East Salisbury Street, continue through the light to the end of the street to Johnny Mercers Fishing Pier. The bench marks are located on East Salisbury Street and extend down N. Lumina Ave. 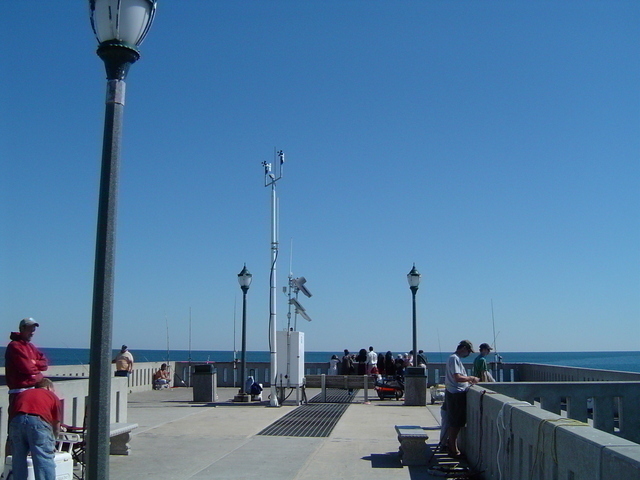 The tide gauge is located on the offshore end of the pier.